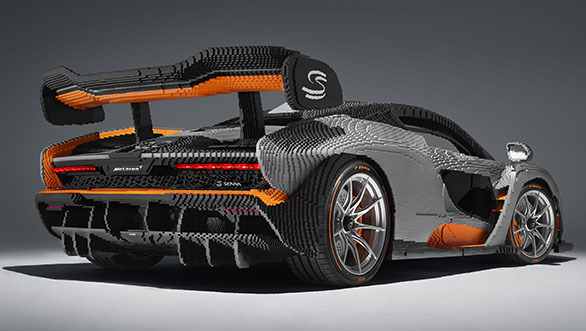 British supercar manufacturer McLaren and Danish toymaker Lego partnered to create a 1:1 replica of the McLaren Senna hypercar out of Lego blocks. The Lego Senna is hand-built using 4,67,854 individual Lego pieces which includes 20,000 specially designed pieces. At 1,700kg, it is 500kg heavier than the actual Senna considering the fact that it does not even have an engine. The Lego Senna took over 2,000 hours of design and development and another 2,725 hours to build from start to finish. In comparison, the actual Senna takes 'only' 300 hours to build. It took 42 people from the Lego build team to design the model, including 10 model-makers who put together the Lego bricks. It does have are some parts from the original car which include the driver seat, steering wheel, pedals and infotainment system. It also has a start button, which when pushed, simulates the ignition sound of the twin-turbo V8 used in the real Senna. Actual McLaren badges are also fitted exactly how they are on the real car. The model uses a steel reinforcement frame to support the structure along with the wheels and Pirelli tires from the actual Senna mounted on the chassis. While the Lego dihedral doors do not open or close, they can be removed and the position can be adjusted. 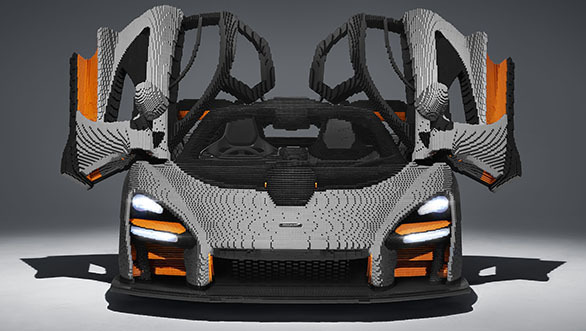 Lego has built many life-size models in the past including the McLaren 720S and the Bugatti Chiron last year apart from manufacturing smaller car kits for kids and automotive enthusiasts. McLaren will showcase the Lego Senna at various shows and events around the world including the Goodwood Festival of Speed this summer. The original McLaren Senna was a limited production hypercar was first unveiled in 2018 with all 500 units being sold out at launch. Named after McLaren's Formula One legend Ayrton Senna, the car is powered by a 4.0-litre twin-turbocharged V8 making 800PS and 800 Nm of torque. This lightweight track-focused vehicle is based on McLaren's carbon fibre monocoque, and comes with a host of aerodynamic features like the large electronically operated rear wing, Formula One inspired roof scoop and front and side air intakes. All this translates into 0-100 kmph time of just 2.8s and a top speed of 335kmph.